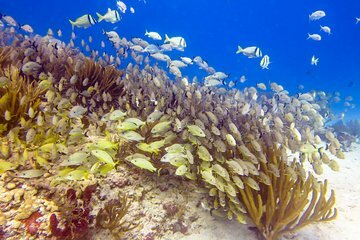 You don't need any diving experience to enjoy the beautiful coral reefs and marine life of Playa Del Carmen. On this half-day snorkeling adventure, you'll have the opportunity to enjoy a boat ride, and get tips from your multilingual guide as you cruise to the reef. Take a dip in Caribbean Sea's blue waters, and see the colorful aquatic ecosystem up-close. Transfer from your hotel: for guests staying in the nearby Riviera Maya Resorts, Mexico Blue Dream provides you with a shuttle service to and from the dive club for a small charge. Please contact us to reserve your hotel transfer in advance.